*It's best to make the raspberry jam and to start the coconut cream the night before. 1 can coconut milk Full fat & no added sugar. Not Trader Joe's brand. Combine all ingredients in a saucepan. Over medium heat, stir the ingredients and mash up the raspberries with a wooden spoon. Stir and cook for 8-10 minutes until the jam thickens up a bit. Remove from heat. Jam will thicken more as it cools. Once cool, store in a jar in the fridge for 4-5 days. Refrigerate a can of coconut milk overnight, and a mixing bowl and mixers in freezer overnight (or for at least 30+ minutes). Whip on high speed until fluffy (takes 5+ minutes.) Add in maple syrup and vanilla and whip again for a few moments to combine. Keep in fridge! Preheat oven to 350 degrees. Oil three 6" cake pans, and line the bottoms with parchment paper cut to fit. Warm the coconut oil in a pan so it is liquified. Pour oil into a mixing bowl along with the lemon, almond milk, vanilla, maple syrup, and almond meal. Sift in the flour, baking soda and baking powder and mix well. Pour into three cake pans. Bake for about 15 minutes or until cake tester comes out clean. Remove from pan and cool on wire racks, also removing parchment. Once cool, place first cake on a plate or cake stand. 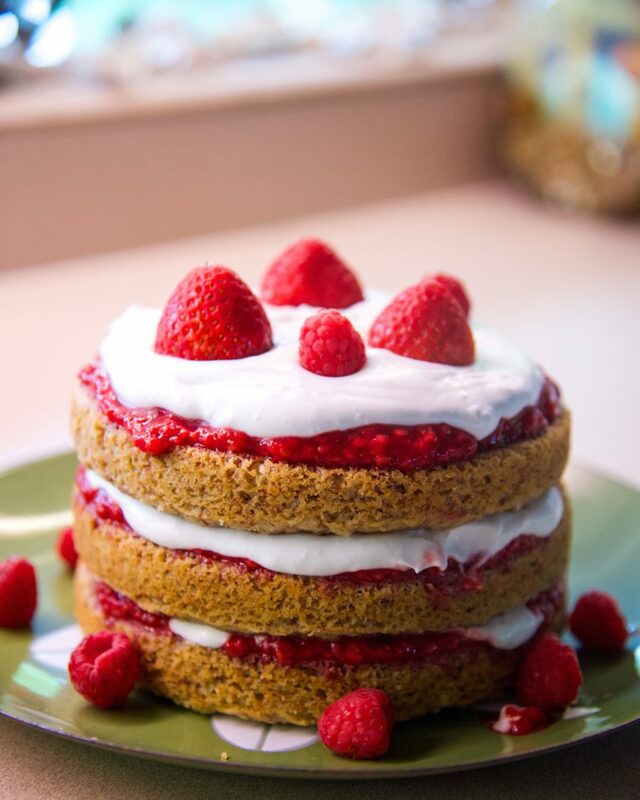 Place a large spoonful of raspberry jam on top and spread to the edges, covering the cake. Then add a dollop of coconut cream and do the same. Add the second cake and repeat, and the third cake and repeat. I love the look of non-iced sides, but you can also try icing the sides as well. Top with raspberries, strawberries or any other fruit that you desire. Serve immediately as the coconut cream doesn't hold up well. Store extras in fridge for a delish treat later!